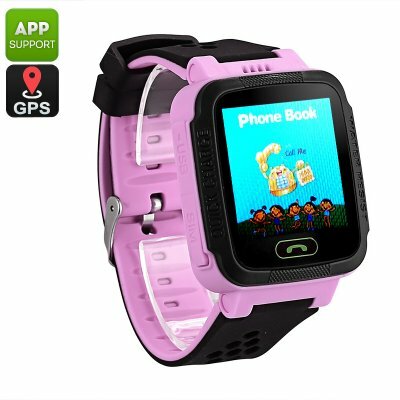 Successfully Added Kids GPS Tracker Watch - GSM Calls, Messages, GPS, LBS, Digital Fence, App Support, Step Counter, SOS, 400mAh (Purple) to your Shopping Cart. Never lose track of your son or daughter again with this stylish GPS kids watch. This child security watch uses both GPS and LBS in order to treat you to an accurate positioning of your child. Thanks to this, you’ll always be able to track the movement of your little ones and constantly be up to date of where they are at. This GPS tracker will significantly increase the safety of your child. With its SOS feature, your child will always be able to reach out to you in times of need. Additionally, you’ll also be able to make regular phone calls and send messages thanks to the fact that this GPS watch for kids supports the input of one GSM SIM card. The watch itself features a colorful design and is comfortable to wear. On its 1.44-Inch touchscreen display, this GPS tracking watch lets your child keep track of the time, number of steps he took, and even play basic games. With a 400mAh battery in place, this GPS kids tracker brings along days’ worth of standby time. Thanks to this, you won’t have to worry every day about recharging this amazing gizmo. The built-in mic and speakers allow easy dual-way communication and its white-list feature makes sure your son or daughter never gets a call from an unknown person. The remote monitoring function lets you keep track of every step your child makes and with digital fence support you can be guaranteed that your little one never wanders off too far.